‘I was brought up in Derbyshire where my family have lived for several hundred years. We have been churchwardens of the village church at Marston-on-Dove, where my elder brother still lives, since 1632 without a break. He will be the final churchwarden there. The Damascene Conversion moment for me was Christmas Eve, 1954, probably my first in long trousers because I’d just started at Rugby public school, dining with my grandfather, parents and brother in the family house. He said, “I think you’re old enough for a glass of port”. A glass was brought, the decanter was pushed in my direction, I poured myself a glass and tasted it, and said “Gosh, Grandpa, what was that?” “Cockburns 1908, my boy”, he said. And that, in all honesty, put me in the wine trade. The bottle of vintage port, with its label, date, and country of origin I could identify with in the same way as my stamp collection, which then became a point of reference in my geography and history lessons at school because I was learning how wine production fitted with those subjects. Later at the LSE, having joined the Wine Society, I was quite clear about wanting to go into the wine trade when I had finished my education. My father didn’t approve of my ambitions and advised me to use my degree in Economics from the LSE to get a job in the City. In the end, I did a deal with him, saying that if I could get two different job offers in the City, I wouldn’t accept them but it would at least show that my degree had employment potential, and I would still look for a job in the wine trade. He accepted that, although in truth any employer in the City in those days would have offered a job to a young man with an economics degree and a private income. I was on to a winner. So in 1964, I joined Christopher’s in St James’s, reputedly the oldest wine company in the country. It was definitely the old fashioned wine trade, and I spent a year as a kind of indented slave in the wine cellars but learning the whole time. In ’64 they sent me to Burgundy for a week and Champagne for another week, then in ’65 they sent me abroad (at my own expense) for 6 months in Europe—to Bordeaux, Burgundy, the Rhone Valley, Germany, Oporto—although nothing about Italy. This was pretty much standard practice in the 1960s for a young man wanting to make his career in the wine trade. I had written in advance to all the employers, the great wine houses of the regions I was about to visit, saying that I was looking forward to working for them and learning all I could, but that I was fortunate enough to not need to be paid thanks to my private means. That resulted in a certain amount of preferential treatment towards me compared to the other “stagiaires” (trainees), so that I would get asked to join the wine tastings, and sometimes lunch, with the aristocratic, and slightly snobbish, employers, who possibly saw me as “one of them”. The result was that I learned a massive amount because I saw it from the inside, and through getting to know the members of the great families who had been producing wine for hundreds of years I learned about the history. Returning to London and the Swinging Sixties, I continued to work in the very active wine trade of those days. Having inherited a substantial sum from the sale of the family sand and gravel business, I bought a property in Provence, a ruin which I intended to restore. I had also met my future wife Bella in ’64, so in 1968 we married, and the same evening took the Golden Arrow train to Paris, and thence to Provence, to make a new life in France restoring the ruined farmhouse. Sadly, we were ripped off right left and centre, and realised by 1970 it wasn’t going to work out. Not wanting to return to England with my tail between my legs, we decided to go to Paris where I could return to the wine trade. On arrival I soon found there wasn’t a wine trade in the same way as England; there were wholesalers, and there were wine shops, but nothing in between, so I decided the best bet was a shop. Passing a boutique de vin in the Madeleine one day, I remarked to my friend that it was my absolute dream of a shop. So we went in, and by good fortune, the lady owner wanted to sell. But not knowing me she was worried that I might destroy her late husband’s reputation as a caviste, and that my poor grasp of French would be a disadvantage. So I agreed to work for her for six months to prove myself, then do a deal if it worked out. 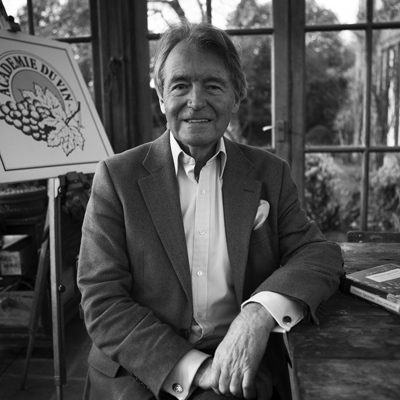 We exchanged contracts on April Fool’s Day, and I then put an ad in the Herald Tribune, published in Paris, which ran “Your wine merchant speaks English—call Steven Spurrier. The only English-speaking wine shop in Paris.” At that time all the British and American banks, and major law firms were represented in Paris, and they were pretty much all in the Madeleine, where I was. So my clientele were already there, and unlike other wine shops, I was choosing and selling my own wines from my knowledge of the vineyards. One of my American clients suggested that I put together a wine course, and I teamed up with American wine writer, Jon Winroth. We took over the premises next to the shop, Jon taught the courses there while I continued to run the shop; Patricia Gallagher became the manager, and L’Acadamie du Vin was born in late ‘72. We were the only game in town, but by forming cooperative business ventures with two or three of the other great wine shops in Paris, between us we were beginning to shake up the whole Paris wine trade. The biggest shake-up however occurred on the 24th May 1976 at a blind tasting L’Acadamie du Vin had organised, by the top French wine experts of the day, comparing some of the up and coming Californian wines to a selection from the finest French chateaux. The tasters had no knowledge of what was in their glasses, with only their palate and experience to judge the wines. To our astonishment, the results of the tasting put the Californian wines, especially the Chardonnays, ahead of the French. The reaction to the results from the French tasters was understandably shock, horror and disbelief. One of the tasters, Aubert de Villaine, called it “un coup dans le derriere pour les vins Francais”, a kick in the backside for French wines. The Californian producer of the winning Chardonnay, when told he’d beaten the French at their own game, said drily, “Not bad for kids from the sticks”. Reporter George Taber from Time Magazine, the only journalist to be present, recorded the event in his book, and the day became known as “The Judgement of Paris”, such was its significance in the years to come. Ten years later, Bella and I were thinking it was time to come back to England, but I was persuaded to go to New York instead, being advised that having been so successful in Paris I couldn’t help but be even more so in America. As it turned out, it was a complete and utter disaster, nearly the end of our marriage, and mainly due to taking my eye off the ball over my business ventures, financially we were in poor shape. Back in London, I created the wine courses at Christie’s, but by 1989 I sold off everything. My 20-year stint as Steven Spurrier, Marchand de Vin, was over. My debts were greater than the value of my only asset, my London flat, as the guys I’d sold the businesses to failed to pay up. The years 1990 to 1993 were pretty bleak, but the road back began with the offer of a job with Singapore Airlines as a wine consultant, and then came the offer of a regular column with Decanter magazine. I was becoming much better known as a wine writer, having written 5 successful books on wine, and it became something I loved doing because I was travelling the world with Singapore Airlines, and writing about the wines I was discovering. That put me back in the centre of the wine trade, and I’m still writing my monthly column.